Lord Horatio writes: “We have recently returned from a wonderful weekend on the border between England and Scotland, courtesy of a distant cousin. The occasion was a reunion of The Hume (or Home) Clan Association, which takes place every five years in and around picturesque Berwick-upon-Tweed. This independently minded town has been regularly used as a political shuttlecock by the English and the Scots. It was batted backward and forward across the border some 12 times in 400 years, before finally coming to rest in Northumberland. One amusing tale is that the town acquired such a separate identity over the years that royal proclamations had to refer to “England, Scotland and the town of Berwick-upon-Tweed.” There was even a suggestion that the town was still at war with Russia after the Crimean conflict because the peace treaty in 1856 didn’t mention it by name. A wonderful tour of the surrounding countryside and various stately piles, complete with suitably blood curdling tales, brought us eventually to The Hirsel, seat of the 15th Earl of Home, son of former Prime Minister Sir Alec Douglas-Home, for the AGM. 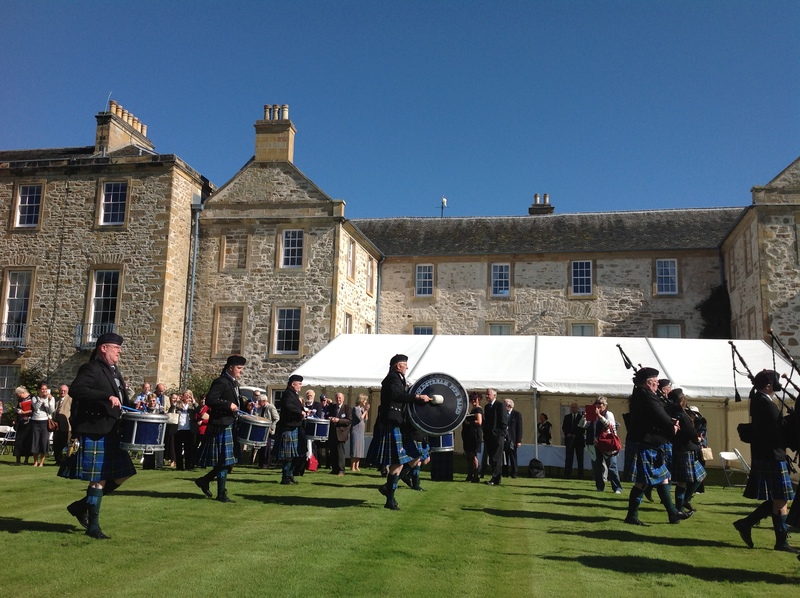 Lord Douglas-Home, chairman of the Queen’s bankers Coutts, and his charming wife Jane treated us all like royalty with a splendid lunch and, to everyone’s delight, a pipe band on the front lawn. During an entertaining speech to the AGM David reminded the gathering of the deadly clan rivalries that existed in years gone by. He recounted how one of his ancestors invited some troublesome neighbours to dinner. When they arrived they were asked if they would like to freshen up and were escorted through the dining room, thrown down some stairs and murdered. When the clan chief wrote to complain about the treatment of his kin folk, the then Earl of Home replied that it was their own fault as they should have noticed as they passed through the dining room the table was only laid for two people! With a nod to the current debate about Scottish independence the treasurer, Charles Hume, noted that plastered on the back of the Welcome To Scotland sign that greeted him as he arrived, was a poster with the words Home Rule. How appropriate!